How To — Butterfly Baby Co.
*When finishing your wrap job, always be sure to tie off with a double knot. 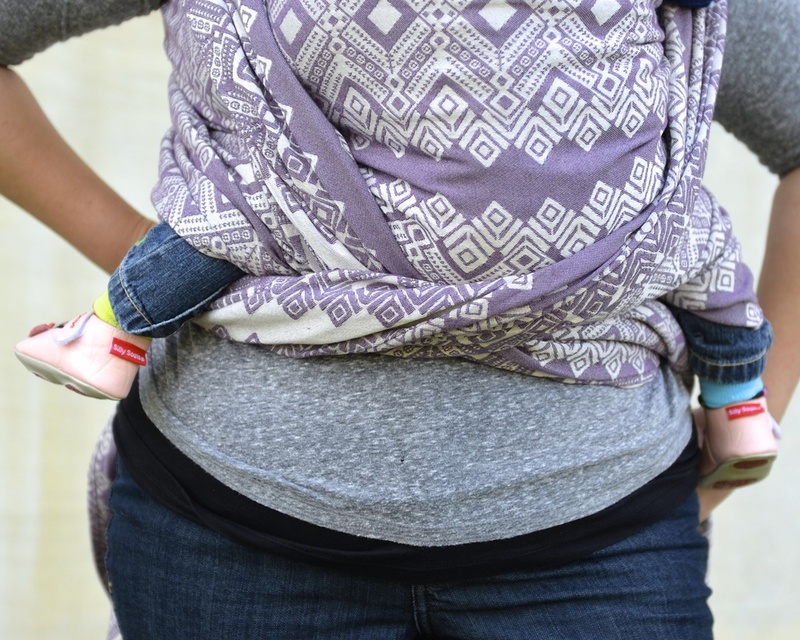 1) Find the middle marker on your wrap and wrap the fabric around your midsection with middle marker at mid-chest. 3) Bring the tails of the wrap over your shoulders and bunch or fold the fabric to keep it on your shoulders. 4) Loosen the fabric just slightly around your torso to create a pocket just big enough to fit your baby. 5) Hold your baby on your shoulder, and slowly and carefully lower your baby down into the pocket that you created. 6) Make sure baby’s legs come out through the bottom of the fabric. Pull the fabric up under baby’s bottom so that the fabric extends from baby’s knee to knee to create a seat. 8) Slowly begin to tighten both ends of the wrap over your shoulders. Tighten strand by strand on each shoulder working from the inner rail of the wrap to the outer rail. Tighten until your wrap is snug and supporting baby from knee to knee, up baby’s back and to baby’s neck. 9) Pull each tail of fabric down beside baby’s body, bring under baby’s bottom and cross the tails to form an “X” under baby’s bottom. Be sure there is sufficient tension to keep the wrap snug and supportive of baby at all times. 10) Gently pull the tails of fabric to raise your baby high enough to kiss and pass the tails of your wrap between you and your baby’s legs and around to your back. 11) Tie the tails of your wrap securely against your back with a double knot. 12) Tug firmly to tighten your knot. 13) Your baby’s face should be visible and kissable at all times. Constantly monitor your baby’s breathing and airway, and look for any signs or distress or discomfort.